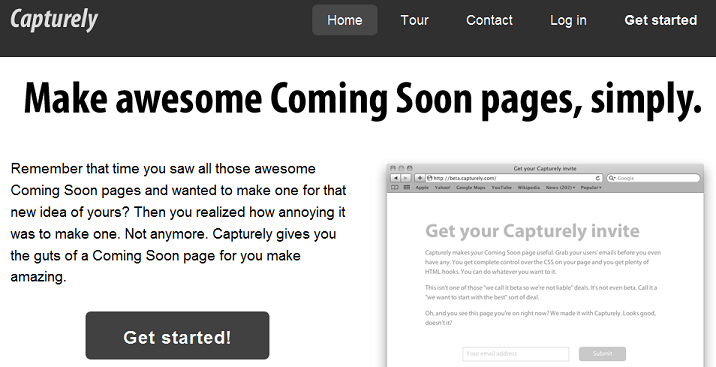 Capturely helps people build an awesome Coming Soon page by taking all the hard parts out. You don’t have to set up any scripts to handle collecting emails or pay for hosting. You get full control over the CSS of your page. Some good-looking templates are in the works now, too. Basically, you skip all the boring stuff so you can spend more time making your page look great. You only pay for value you get. If you don’t collect many emails then it’s probably free. People who have more emails pay a bit more. You buy credits to unlock the emails. Your lists show the first 20 emails in your list and you need to unlock them after that. Do you find a service like Capturely useful? Why / Why not? If not, is there anything that would make it useful? Is it clear how credits work? Please share any general thoughts or comments you might have. Free 20 credits available to feedback providers. Claim credits by signing up and contact Capturely (email contact@capturely.com or via Capturely’s contact form) with “StartUpLift Credits” on subject line and a link to your feedback on StartUpLift.